Lake Crescent real estate is hard to find, partly because it is a gorgeous lake in high demand and partly because there is very little privately owned property on the lake. 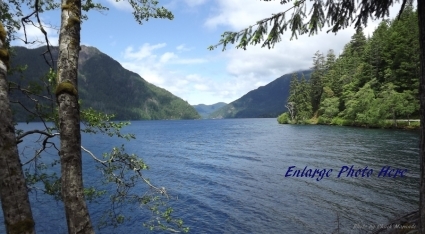 Lake Crescent is a deep blue lake west of Port Angeles on the Olympic Peninsula. It’s a very enjoyable afternoon drive from Sequim or Port Angeles, and the stunning beauty of the Olympic National Park is well worth the drive. Lake Crescent is a very deep lake, and no one knows precisely how deep it is, because the one time it was measured at 1,000 feet, that was as far as the equipment could measure. The entire lake is within the National Park, so that’s another reason finding Lake Crescent real estate for sale is almost impossible. I am asked periodically if there is any Lake Crescent real estate for sale, and my answer is almost always, “no.” There is very little privately owned property on the lake, and those who own a home on the lake have no interest in selling. The only practical way to buy Lake Crescent real estate would be to have wheel barrels full of money and offer a current owner enough to motivate them. Short of that, this is a worthwhile drive on a beautiful afternoon. Just don’t look for Lake Crescent real estate for sale signs.